Barack Obama sending 300 military advisers to Iraq: The president’s comments reveal a cold-blooded realist. On the future of Iraq, President Obama is a cold-blooded realist. Obama the Realist speaks about Iraq at the White House on June 19, 2014. 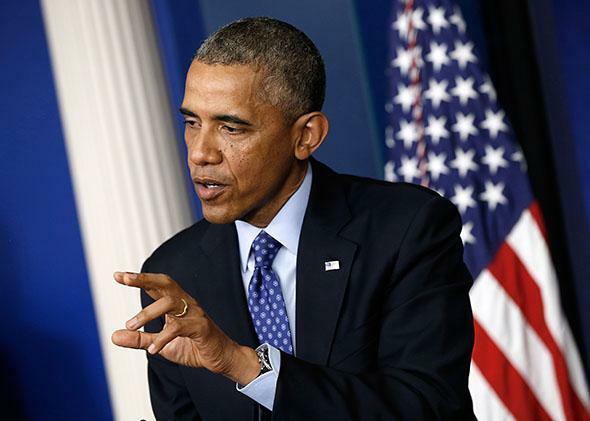 On Thursday afternoon President Obama announced that he’s sending military advisers to Iraq. The announcement—prompted by the advance toward Baghdad of rebel forces, led by the Islamic State of Iraq and Syria—set off predictable reactions: Will advisers lead to mission creep? Is the Iraq war back on? But Obama drew sharp distinctions between his approach and that of President George W. Bush. Here are the central points he made. Recent days have reminded us of the deep scars left by America’s war in Iraq. Alongside the loss of nearly 4,500 American patriots, many veterans carry wounds of that war, and will for the rest of their lives. … What’s clear from the last decade is the need for the United States to ask hard questions before we take action abroad, particularly military action. That’s a pretty clear slap at neocons who have come forward to accuse Obama of squandering Bush’s victory. Obama isn’t going to tolerate that narrative. His view is that the neocons wrecked Iraq and that the latest crisis is just another mess he has to clean up. And he’s increasingly willing to say so, now that polls show strong public opposition to the war. 2. We’ll save Iraq’s head, but not its limbs. Obama said U.S. personnel would start by focusing on “the perimeter around Baghdad and making sure that that’s not overrun.” He called this “a good investment for us” and contrasted it with “a larger commitment of troops to actually fight in Iraq,” which he said would not serve our interests. If Baghdad’s leaders remain sectarian, they “will not be able to control huge chunks of their own country,” he warned. Regaining those chunks will require domestic political compromise, not American troops. 4. Prime Minister Nouri al-Maliki must go. Obama never used those words. Instead, he said in his prepared remarks that while “it’s not the place for the United Sates to choose Iraq’s leaders,” only politicians with an “inclusive agenda” could get Iraq through the present crisis. When a reporter asked Obama whether he had “any confidence in Prime Minister Maliki,” Obama said that the Iraqi government had failed to earn Sunnis’ trust and that “deep divisions” among Shiite, Sunni, and Kurdish leaders had worsened over the last two years and were crippling the government’s ability to deal with the ISIS threat. Obama said that he had repeatedly explained this diagnosis to Maliki and noted that Maliki had refused to grant U.S. troops the legal immunity that would have allowed them to stay in Iraq after 2011. We also have an interest in making sure that we don’t have a safe haven that continues to grow for [ISIS] and other extremist jihadist groups who could use that as a base of operations for planning and targeting ourselves, our personnel overseas, and eventually the homeland. And, you know, if they accumulate more money, they accumulate more ammunition, more military capability, larger numbers, that poses great dangers not just to allies of ours like Jordan, which is very close by, but it also poses, you know, a great danger, potentially, to Europe and ultimately the United States. Obama didn’t clarify at what point, and to what extent, this gradualist logic justifies U.S. military intervention. But he did endorse the logic, and a rationale therein for the use of force. What emerges from Obama’s remarks is a portrait of cold-blooded realism. He thinks our invasion was reckless. He thinks we gave too many lives and spent too much money. He sees ISIS as a threat to regional stability, our oil supply, and our security from terrorism. He’s willing to use force, but only to the extent necessary to quash that threat. Beyond that, he’ll leave the restoration of Iraq to Iraqis. And if that means replacing Maliki, Obama won’t shed any tears.